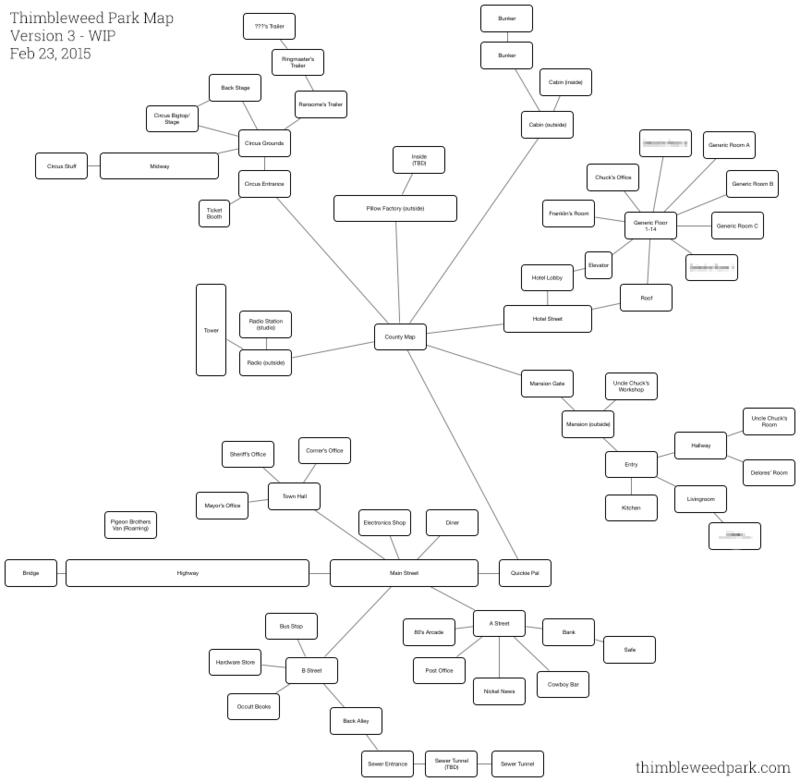 It's Monday so it's time for a big fat meaty Thimbleweed Park dev blog update and for today's action packed episode we're going to dive into maps and puzzle dependency charts. These map and puzzle chart refinements are the result of the two-day brainstorm Gary, David and I had last week. I've blurred out anything that could be a spoiler. First up is a map of the world. We had much of the map figured out for this post, but as the puzzles become more solidified, the map can change with a whirl of additions and deletions. We might come up with a location that sounds fun, but later realize it serves no real purpose so we remove it. The room stays on a list and might come back, but only if we find a good use for it. Cutting stuff is almost as important as adding stuff. Every room in the game should have a purpose. Most of the time that purpose is to find an object or solve a puzzle. Sometimes rooms exist just as a home to a character needed for story reasons, but that is usually coupled with a puzzle, but not always. Rooms can exist to help define the world, maybe it's an establishing shot or an overlook to help players understand where they are, or to set a mood. If the room is just something to be traveled through, it should be cut. If the room only has one small purpose, also consider cutting it. One of my pet-peeves with "director's cuts" of movies is that a lot of those scenes should have been cut and were initially cut for a reason, only to be brought back by marketing departments to sell more DVDs. Of all the rooms that were cut from Maniac Mansion, Monkey Island, the Humongous games (or most anything I've done), I can only remember a few that were cut because we ran out of time. Most were cut because it made the game tighter and better. Sometimes I've resisted cutting, fought and argued against the cut, only later to find the game better for the loss. Don't be afraid to cut. Cut, cut, cut. As a perpetual warning to readers of this dev blog: don't get too attached to anything you see here. A lot is going to change over the next 18 (I guess it's 16 now!) months. It's part of the process. Cut, cut, cut. Next up is the puzzle dependency chart. This looks quite different from the one posted a few weeks ago, mostly because this dependency chart is just Act I, where the other was a small chunk of puzzles from all the acts. The first chart was getting a little unruly, so I started over and began building from the beginning. I'm really happy with the shape of this chart and by shape I really do mean the shape of it. It has that much sought after diamond shape, starting small, branching out and then pulling in. It means players aren't going to be overwhelmed at the start, then they have multiple puzzles to solve in parallel, then everything pulls and focuses in at the end. There are a few puzzles not shown on this chart that players will start solving in Act I and not complete until Act II or Act III. There aren't a lot of them, but a few are needed so players can have nice epiphany moments with characters, puzzles or objects they found hours or days ago. I would estimate this chart represents a little more than a third of the game. Act II should be a little bigger, Act III will be about half this, then the character epilogues (which shouldn't be very long). Also, this puzzle chart contains three nodes labeled "Ransome Flashback", "Delores Flashback" and "Franklin Flashback". These nodes are the playable flashbacks and consist of small self-contained little adventure games, complete with their own puzzle charts (not shown). Each of the flashback adventures should take about 15 minutes to play and help set up the characters and their backstories. We wanted to do them as "playable" so players didn't have to watch long cut-scenes. I firmly believe players shouldn't lose control for more than 10 or 15 seconds, maybe 30 at the most (and rarely). Adventure game stories should be played. If I wanted to watch a story, I'll watch a movie, they do a much better job of it. Last week I focused on design and didn't even crack open Xcode. This week is going to be non-stop programming and the week after is kind-of screwed due to GDC. I mean "screwed" in the good sense. GDC is a lot of fun. I really enjoy(ed) your work. Here is a probably stupid question, because I'm attending the GDC, too. Do you have any free spots available for a 'developer-fans' meeting? Playable flashback mini adventures! I like it. I completely agree with you -- one of my biggest pet peeves with games in this genre (and, now that I think about it, any genre) is surrendering player control for chunks of time with expository cutscenes instead of letting the player discover the story on their own through gameplay. I can't tell you how many adventure games I put down after yelling and swearing at my computer to just let me play the darned game! Thisng are starting to take shape, aren't they? I just feel the need to comment every post. Why do so many people type "loose" instead of "lose"? Because they sound almost exactly the same and look almost exactly alike and because English is a stupid language for those two reasons. While I have your attention...Since this game is apparently being set in 1987 (or thereabouts), are you going to make it somewhat of a priority to squeeze in as many funny references to the technology back then: "portable" computers, 5 1/4" floppies, speedy dial-up 2400 baud modems, calculator watches, VHS tapes, the dawn of the CD era, the portable cassette player (Sony Walkman), cable TV having SO many channels, the Polaroid instant camera, animatronic teddy bears, etc. I want to TASTE 1987 while I'm playing this game. Kind of like hairspray and Crystal Pepsi. Yum. I'm not big on pop culture references, but I do find the 80s to have a bizarre mix of fictional product spokesmen- a virtual reality talking head, a surfer dog selling alcoholic beverages, and some dancing and singing dried fruit singing your favorite classics of the 50s. Apparently Crystal Pepsi came out in the early 90s. So, unless there's a time machine involved, 1987 will probably taste more like hairspray and Coke II. (It was actually referred to as "New Coke" back then). I need to make sure I do my research ahead of time, next time. Eh, a little spelling slip-up. It's because the /u:/ sound is often spelled as "oo" in English, but "o" is rare. (In fact, I can't think of another word where "o" represents /u:/) So, when one says "/lu:z/"it's perfectly understandable why it would come out as "oo" when you're typing or writing it. Great! It is a pleasure peeking at your development workflow. I wander how you use the dependency charts after you have defined them. Are them coded inside some "dependencyChart" data structure? If not what is your approach on implementing them into the game? The dependency charts are like any other form of game design documentation: You use them to help understand the game and get your head around all the complexity, then you forget about them and never update them unless some publisher milestone requires you to. Ron, will you be talking about Thimbleweed Park at GDC? Nope. Talks for GDC are submitted in Aug. Not sure what I'd really talk about at this point. I love watching the game unfold. As I was reading this post I was thinking how it would be pretty cool to have an option for a second play-through of a game like this where you could watch the puzzle dependency chart unfold as you are playing. Do you a display like this for debugging during development? Random question - what software do you use for creating these flowcharts? They are done in OmniGraffle. What is GDC, please? I guess some convention. GDC= greatest denominator in common ? So, for being able to to leave Thimbleweed Park and go to the County Map, you'll have to go through Quickie Pal? Good catch. There should be a QuickiePal exterior room that leads to the map and also to the store interior. But, maybe, the map is found IN the Quickie Pal. Gotta say that our two-day brainstorming session was a blast. Made me feel like it was back in 1987 working with Ron and Gary again. More on the session in an upcoming blog post... Happy to be on the project and moving forward! I'm glad to hear that, David! I'm glad you are onboard. I hope you get Noah Falstein onboard as well. Players of the classics have been hoping for something like this for a long time. I must say it feels both fresh and like a long trip down memory lane. Apropos trips. Pssst. ... I loved the "world tours" that brought Zak to most interesting and distant locales all across the world. That was very special... so with TP being a new game in the spirit of Maniac Mansion, most of all, I am hoping it will be a great success. Big enough so maybe, you'd like to make one other game .... in the spirit of Zak McKracken. Let us travel the world again ... running from something, solving a mystery, helping friends, and saving our dear planet earth from another invasion that had been going on in secrecy ;). Nice gravatar, very lifelike. The hat is a nice touch too! Did Gary draw all of these? Or did you guys each made a self-portrait? I am trying not to spend too much time analyzing the charts and the screenshots as I really want to feel the effect of "finding an unopened Lucasfilm adventure game in the drawer" to the max. I don't want to spoil it. Will these charts be available after the game is released, so that we can see the progression in a documentary fashion? Yes, we will have all these charts and maps available once the game ships, including unblurred versions. Oh, and not for Ron or David, of course. The whole concept of the game has a little "twin-peaks-spirit". I really love that. Thanks in advance & keep up the good work! Thank God he didnt take my life away yet, just to get my hands on TP and of course Star Wars 7-9. Now my life has a meaning. Years ago I bought a game named Syberia, authored by the famed comic artist Benoit Sokal. Back then I really liked the game,. as it was atmospheric and pretty. Some time ago I re-played it and I found it dull and slow mainly because of the reason I originally fell in love with it. It had very little text and it had a lot of flavour locations which were there only to serve as padding when you walked back and worth between a couple of locations you could actually DO something in. The game still has atmosphere, but it also had glaring issues in the way it was designed. Too many things were designed to just look pretty without any actual function. This slowed the game down and made it feel like more of a chore than a fun experience. I'd like to make a proposal here, if nobody else has brought this forward before. Ron, when some material is cut from the game, and some game assets have already been created for that. Like a half finished room, an inventory object, or maybe even characters. Would it be possible to collect all these strips and bits of cut pieces and collect them somewhere until the game is ready to be released, and then show these cut things off in some way, inside the game, like Extras on a DVD? Maybe with written information or spoken commentary? I really love the way this dev blog goes. I have backed several Projects on Kickstarter but nothing like this before. My recent Experience with Kickstarter Projects was more like GIVE ME YOUR MONEY AND SHUT UP. And weeks over weeks you hear nothing at all from them. If you request an update normally you´ll get not even a response. But this one shows that it can go a better way then that. Proud to be a baker! Out of curiosity, did you back Pier Solar HD? Watermelon has to be the absolute worst company ever when it comes to communicating, giving news updates and leaving it's fans in the dark. To Watermelon's credit though, while it takes them forever and they stay silent for months at a time leading people to believe that they got burned on their purchase, Watermelon does eventually deliver a great product. That's exactly why the solution to most kickstarter woes is TRANSPARENCY. Ron and Gary have upped it by posting everything on a blog rather than just to their backers. That way, they're as transparent as possible (the only thing they hold back is plot spoilers, which I think we all agree they should be as opaque as possible). I really hope the "80's Arcade" makes the final cut. I'm not expecting any of the machines to be playable, I just want to see what titles and designs you guys come up with for the arcade cabinets. Why not? If you could play Maniac Mansion on Ed's computer, why not play Ron Gilbert's Monkey Island 3 on an arcade? That would be the best easter egg ever. Of all the thing that will never happen, this is number one. He doesn't own the rights anymore. Then how about "Ape Atoll"? Yeah, or "Island of the Apes". When you work for a company producing intellectual property you don't own what you create during work hours (and in some instances the company own everything you produce while being under contract regardless if it's done on your own spare time or during work hours), that is why Disney and not Ron Gilbert, owns Maniac Mansion and Monkey Island. putting it in a game arcade for a game that is commercial might evoke a cease and desist letter from Disney.